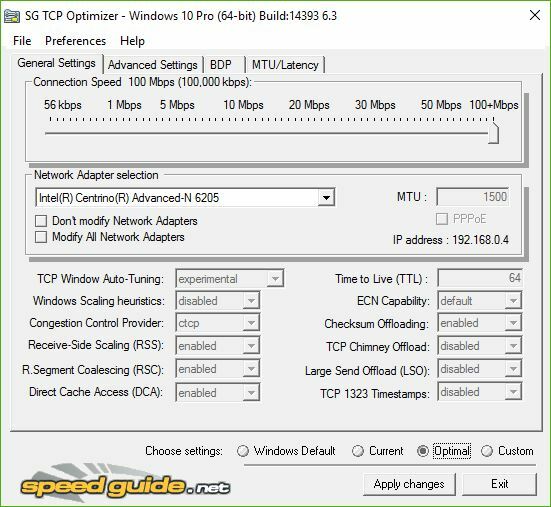 SpeedGuide.net is a broadband networking resource online that offers numerous free software tools and utilities. Their SG TCP Optimizer program asks you to input your download speed, then tweaks a raft of TCP settings for your network interfaces in response. The result is usually a slight to moderate speed improvement, with a smoother, faster ramp-up to high levels of interface performance. You can download this utility from the SG TCP Optimizer home page. You must right-click the program file, TCPOptimizer.exe then select “Run as administrator” so it can make changes with appropriate privileges. If you choose, you can manage hundreds of TCP settings one at a time, with the benefit of massive documentation. There is also a collection of tweaking articles, an Optimizer FAQ, and a range of user forums available for technical info and aid. But the easiest way to use the program is simply to select the “Optimal” radio button at the lower right of the program window. SG TCP Optimizer does an excellent job of picking the right tweaks for you quickly and automatically. Making good use of SG TCP Optimizer is as simple as clicking the Optimal radio button. I tried it out on half-a-dozen systems, and found the utility generally delivered a slight performance improvement for my GbE wired network interfaces (in the range of 1-2%). These already benefit from the putative 300 Mbps service I get from Time Warner (which actually tests out at around 350 Mpbs using the TW Speed Test). It did somewhat better with my 802.11n and 802.11ac wireless interfaces (5-15%) because they operate in a range from 50-100 Mbps and are subject to more jitter and variability. The site offers a range of other free tools, including a TCP/IP Analyzer, a security scanner, a speed test, an IP address locator, a collection of common IP tools (such as ping, traceroute, whois, and so forth), and more. I’m going to have to check these out, too, and see how they work. There may be some resulting follow-up, if the other tools are as good as SG TCP Optimizer seems to be.